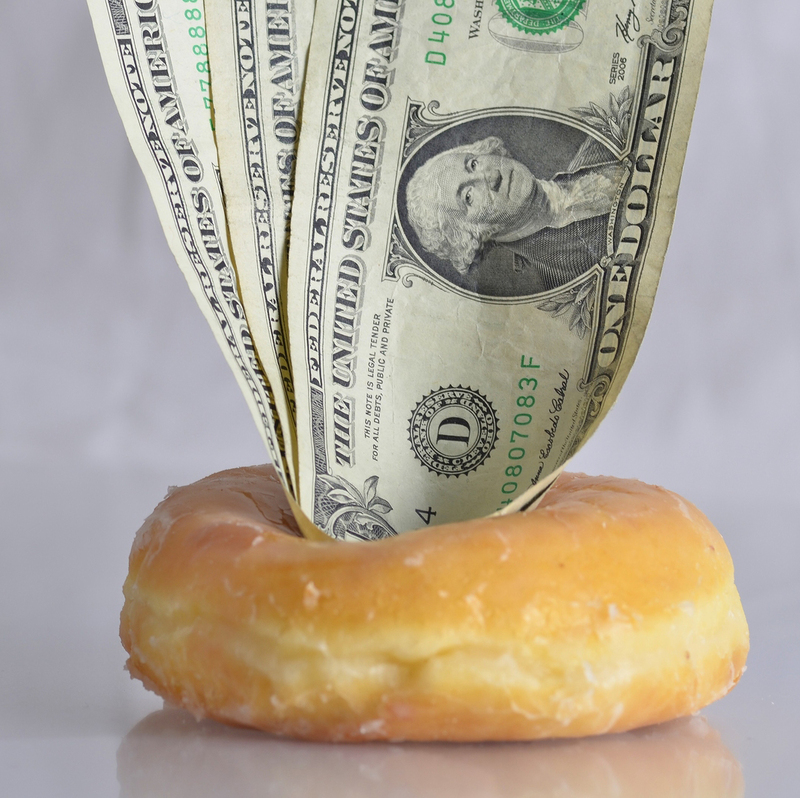 Kerrey23 asks: Where did the expression “dollars to donuts” come from? Sometimes the table was graced with immense apple-pies, or saucers full of preserved peaches and pears; but it was always sure to boast an enormous dish of balls of sweetened dough, fried in hog’s fat, and called doughnuts, or olykoeks —- a delicious kind of cake, at present scarce known in this city, except in genuine Dutch families. It has often been claimed that the holed doughnut was invented just shortly before this in 1847 by one Captain Hanson Gregory, see: Why Do Doughnuts Have Holes. The alternate spelling “donut” is said to trace its roots to 1870 and “Josh Billings,” although after doing a review of the 1870-1879 edition of Josh Billings’ Old Farmer’s Almanac, it appears to only reference doughnuts (and, incidentally refers to them as “greasy,” but in a good way). In any event, “dollar” is a much older word, tracing its roots back to the Low German daler and first appearing in English in the 1550s. It has since been used to describe a variety of currencies, most notably for the topic at hand, the U.S. dollar in 1786. Whenever you hear any resident of a community attempting to decry the local paper . . . it’s dollars to doughnuts that such a person is either mad at the editor or is owing the office for subscription or advertising. Given that the newspaper used the expression without explaining it or otherwise giving emphasis, it is likely the author felt that people would already be familiar with the phrase, so it had probably been around in slang for at least a few years up to this point, if not longer. 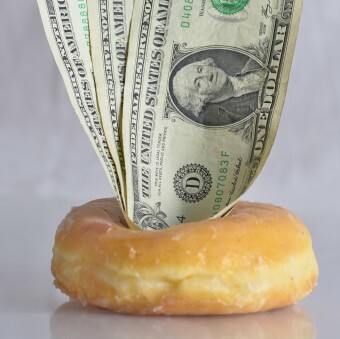 As to why “dollars to doughnuts,” beyond the alliterative qualities, it was essentially just a way to say you’d bet dollars to something mostly worthless, relative to the dollars, emphasizing how sure you are that you’re correct. Going back to the 1840s, there was a very similar expression with the same basic meaning “dollars to dimes.” Two other similar expressions also existed in the 1880s “dollars to dumplings” and “dollars to buttons.” A couple decades later, “dollars to cobwebs” also popped up, but none of these had the staying power as “dollars to doughnuts.” In all cases, the latter thing is the worthless item relative to the value of the dollars, but you’re so sure about what you’re saying, you’ll happily bet your dollars to someone else’s doughnuts over the matter. Here in the heartland, “dollars to dill pickles” is common. Doesn’t even address the question until the 7th paragraph, why would you assume people curious about the origins of an expression also want to know the etymology of every word involved? And if you are going to provide the etymology you should have included some pretext for where “to” comes from, it would have been equally (ir)relevant. Thanks for the info though, interesting. It’s no longer such a lopsided bet anymore, and in fact is becoming lopsided the other way, since doughnuts now cost over a buck. Don’t get your doughnuts from Krispy Kreme either, it’s a ripoff. They’re little bitty things, overpriced and mostly air.